Trailer Feature and Swag Giveaway! "Ever since Kait Swanney could remember, the old crones of the village have been warning her to stay away from the selkies. They claim that like sirens of old, the seal men creep from the inky waters, shed their skins, and entice women to their deaths beneath the North Sea. But avoiding an encounter becomes impossible when Kait is spotted at the water’s edge, moments after the murder of a half-selkie infant. Unexpectedly, Kait is awoken by a beautiful, naked selkie man seeking revenge. After she declares her innocence, the intruder darts into the night, but not before inadvertently bewitching her with an overpowering lure. Kait obsesses over a reunion deep beneath the bay and risks her own life to be reunited with her selkie. But when she lands the dangerous lover, the chaos that follows leaves Kait little time to wonder—is it love setting her on fire or has she simply been lured?" Did you love it as much as me? I hope so!! :) Now for the swag! YAY, SWAG, I hear you say! If you want to get your hands on these wicked bookmarks, or book plate, here is your chance! Once you have done 2 of the above, e-mail Krista at KGHolle@gmail.com with your name and address and please put Free Bookmark in the subject line so you don't end up in spam. Be sure to let her know your Twitter and Facebook names. 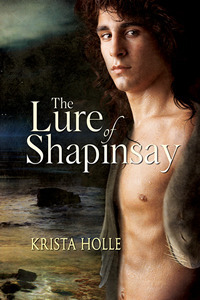 Buy The Lure of Shapinsay now!